So for all of the above it seemed fitting that my husband and I married on the 5th November (for all those non-Brits the 05/11 is when we have fireworks and bonfires to commemorate the date of Guy Fawkes’s failed attempt to blow up our house of parliament). Doing crafts with my kids! This idea was so simple and quick and we were all really proud of the result. 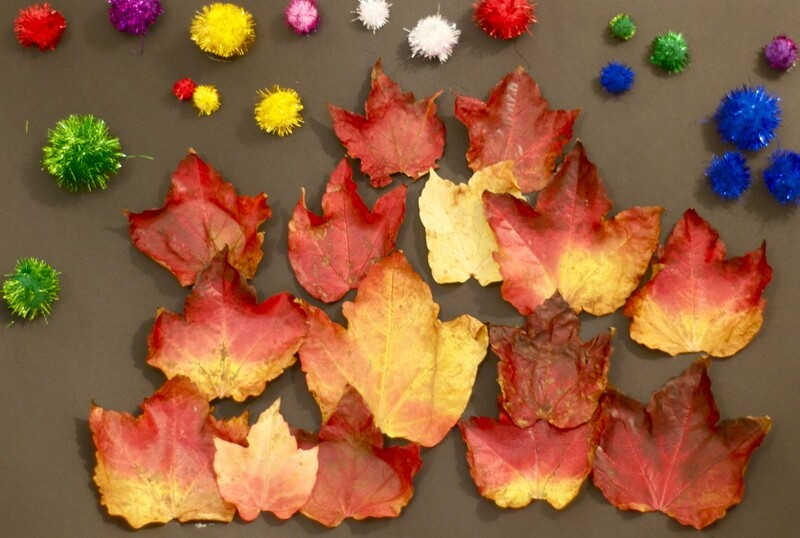 We found great flame-like Autumn leaves and bought some sparkly pom-poms, then all we had to do was stick, stick and stick until we had a bonfire pic to remember, remember the 5th of November! I love this! Easy enough for the kids to do totally on their own — I love that. And I completely agree with your tips — the easier the better. So pretty! I think this is a craft simple enough for even me to tackle…..! That looks great. The leaves are really beautiful in London at the moment. You don’t like craft with your kids??? I can’t believe it, Mo, you’ll be saying next that you find your children tiring and slightly irritating! But seriously, don’t give up – for one thing your children are really young (mine are 3 and 5 and it’s so much easier now) and for another that bonfire picture is blinkin’ gorgeous! It’s not strictly speaking craft but two of our most successful activities recently have been painting stones and then putting them all in old cardboard fruit trays and a game we call ‘cooking’ but is basically taking all the out of date stuff from my food cupboards and fridge (I don’t mean the actually mouldy things – and believe me there are green things in my fridge – just the stuff past its sell-by date) and mixing them up with wooden spoons in a big bowl – my girls love this! You won’t want to post a photo of this on the Babyccino website, mind, it’s not very pretty. Camilla I love your stone idea and I think I could brave that – I also have done the ‘off’ food thing – in fact it was only this last weekend that I realised I had herbs and spices in my cupboard that went off in 2006! I’m a bit embarrassed by that – but you think spices will last forever (or at least I did). Anyway my kids loved making ‘soup’ with them all and the jars were just a perfect size for them. I might clear out my tin cupboard one day this week – that is bound to have some treasure for them!